Gov Ibikune Amosun has said Aisha Alhassan, Minister for Women Affairs, should have resigned her position after championing the emergence of ex-vice president Atiku Abubakar as Nigeria’s next president. Governor Ibikunde Amosun of Ogun State has said it is only illness that can stop President Muhammadu Buhari from seeking a second term in 2019. Amosun stated this in an interview with newsmen after a book launch and scholarship scheme, to commemorate the one year remembrance of Chief Lamidi Sofenwa, at the Nobel House College in Abeokuta on Saturday. He noted that the Buhari-led government came at a time Nigeria was experiencing security challenges, which resulted in loss of lives and property in the North East region. “The only thing that can probably prevent Mr. President from contesting is on health ground because if not for this administration of President Muhammadu Buhari, only God knows where Nigeria would have been." He said Aisha Alhassan, Minister for Women Affairs, should have resigned her position after championing the emergence of ex-vice president Atiku Abubakar as Nigeria’s next president. 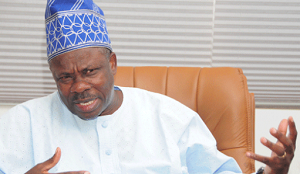 Amosun said although the minister has the right to express her stance, she cannot be loyal to two masters. “Though she is entitled to her own opinion at any point in time, she should have just resigned her appointment because her loyalty cannot be in two places,” he said.